What it’s about: Fearless optimist Anna teams up with Kristoff in an epic journey, encountering Everest-like conditions, and a hilarious snowman named Olaf in a race to find Anna’s sister Elsa, whose icy powers have trapped the kingdom in eternal winter. Review: You all know I’m a huge Disney fan and I’m really surprised I didn’t see this film sooner but never mind, I’ve seen it now and it was incredible. Frozen is about two sisters, Anna and Elsa who drift apart due to Queen Elsa being possessed with powers that have turned the entire kingdom into Arctic conditions. Anna teams up with Kristoff, his reindeer Sven and a hilarious snowman called Olaf who seems familiar in an attempt to find Elsa and help save the kingdom from destruction. I absolutely loved the idea of the story and the ultimate love aspect being between two sisters – not a romantic love. Which really does make a change and I think the change of pace definitely noticed in the reaction to this film. That’s not to say there isn’t any romance in it, there is, but it’s not over-done and it’s extremely cute. The characters in this film felt to me a little different to other Disney films and I really liked it. Anna was fantastic and for once, a somewhat real representation of what a girl is like! She’s not perfect, she’s ditzy and clumsy and that’s what made her so likeable. I don’t think I’ve ever laughed so much at a Disney film before but I can honestly say, I thought Frozen was hilarious. 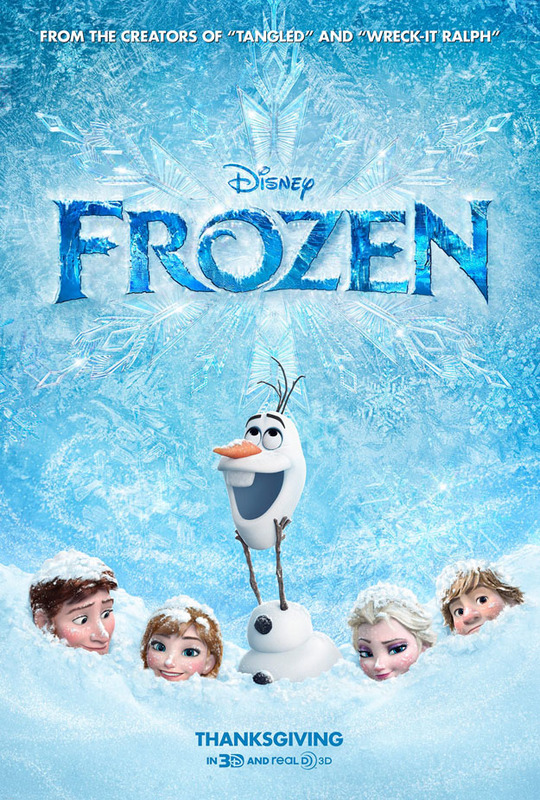 All the characters put together in the situation, their different personalities and back grounds really did make for an amusing film – especially Olaf, the snowman. One of the best Disney characters, ever! I do have something to pick at though and that was Elsa. I didn’t like her character much which was a shame because she was pretty and elegant (I can say that about an animation, right?) I also wasn’t too fond of Idina Menzel as the voice of Elsa. Let It Go has proven to be an extremely popular Disney song and I can completely understand why – I found myself singing along to it when it came on – but I felt it was just screeched. I don’t like Idina’s voice at all. Elsa just sounded like she was shouting the entire thing which ruined it a bit for me. However, that’s only one small little thing amongst a pretty incredible film so it didn’t make me enjoy the film any less – just that one song. Overall, Disney really have upped their game and Frozen is hands down one of the best films they’ve produced. Nice review. Really want to see this. I still haven’t got round to watching this! I can’t say I was a huge fan of this one. It broke out into song too much for my liking. I didn’t hate it, just didn’t love it as much as everyone else seems to! Yeah I can understand that. I’ll admit I didn’t like this one as much as I enjoyed Tangled and Brave!